This Soviet designed surface-to-air missile was the first to actually take down an enemy aircraft in flight. The SA-2 Guideline was deployed near Soviet cities, such as Moscow, to defend against USAF bombers during the cold war. Later, they were also used in East Germany. This scale model rocket has three sets of fins, and an expanding tail cone. This unique design can make it fun to build, and exciting to launch on a D, E or F motor. 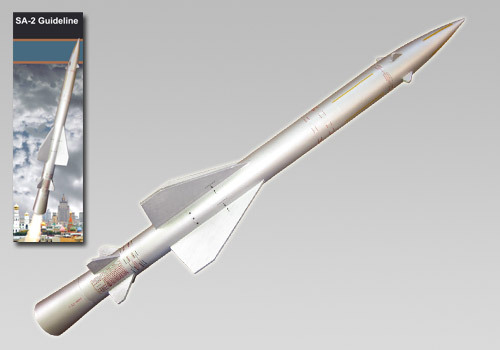 This scale kit comes with 26 parts including plastic Tail Cone, Ejection Baffle, Plastic Nose Cone and 3 sets of laser-cut fins and water-slide decals are included to add lots of detail to this scale model rocket kit. Colorful instructions and the decal placement schemes are provided. This kit comes with a lot of nose weight and requires the use of Epoxy. Fins need to be tapered or rounded.